Discussion in 'Community Projects' started by darthmorf, Nov 1, 2017. Hello everybody, and welcome to Creation Compendium #54! The results of the logo competition are in! We've chosen our favourite three out of the entries and will rotate through them (probably fairly randomly!) as time goes on. But before I get to that, please remember to send all entries for CC #55 to @QuackersDelta! Make sure also to ensure you're up to date with the latest CC rules (they're not very long). 5) The CC is a showcase, not a contest. All entries submitted (that are within the rules) will make it into the post. 6) Content such as memes, image macros, and other such content that does not contribute to the Compendium's message of expressing your creativity will be rejected. These "low-effort entries" will be taken out at the CC team's discretion. Anyway, enough of that. Let's get on to the Logo Entries! This entry was extremely striking and looks really cool - especially on a dark background! This entry is extremely cool as each letter is themed as an in-game boss. Pretty funny how the numbers happened to be the correct amount eh? The art in this entry is stunning, combined with the effects/filters this entry is definitely our favourite! Thank you to everyone else who entered! Take a look at these great runners up, the competition was very close! Now, onto the rest of the entries! "Are you sure this will work, Keeper?" "I'm not sure of anything this close to the Conjunction, Quentin. But I do believe it is our best hope. Now, please be quiet while I summon the Powers." Fog swirled faster around the two of them. The Keeper's web of mirrors reached out across space, finding its targets and drawing them into the room. There was a flash of red light and the Aberrant stumbled forward. A seven-foot-tall tower of flesh and teeth cloaked in layers of tattered clothes. A colorful scarf concealed a jaw so huge as to be useless. It carried a blackboard and chalk as a surrogate voice. Another flash, pink this time, and the Anomaly appeared. A mop of red hair perched incongruously on a body of pink flame clad in an impeccable two-piece suit. Eyes like points of burning magnesium flicked around the room. A third flash of dull purple. The Abomination, emissary of the Corruption, stepped forward delicately on mandibled feet; a horror of oily grey flesh and bulging eyes, with a mouth that split its torso in half. Aberrant tried to get his bearings. The room was filled with fog, the walls indistinct but likely of stone. There were two beings standing in front of him. The first wore a suit of hallowed armor with the visor down, and leaned casually on a massive hammer. The second was only an indistinct shape swathed in silky fabric, with an ovoid mirror where its face should be. <What are you, and why have you brought me here?> The voice of Abomination filled everyone's minds, sinuous and menacing. The mirror-faced thing spoke slowly, choosing their words with care. "I am the Keeper, curator of the worlds. The three of you, the representatives of the three Powers, are here because your help is required. In just two weeks, there will be a Conjunction of Worlds. It is a time when bindings weaken and anyone can die. Permanently." A hush fell over the room. The planet's magic made death nothing more than an inconvenient trauma. To live here was to die, repeatedly. One got used to it. Permanent death, true death, was unthinkable. The Keeper continued. "And during this Conjunction, a certain very important binding is going to break. You know what I mean: The Moon Lord. Despite my efforts, the bindings cannot be reapplied or reinforced. In just two short weeks, the most dangerous being in the world will be free to kill us all, and there will be no resurrections." "You are here because you represent the three Powers of our world. If there is to be any hope of containing, or rebinding, or perhaps even killing the Moon Lord, you three will be indispensable to that effort. But, more importantly, we need allies. There are Other Powers which reside on the moons. They must be recruited and summoned to our aid. That is why you are here." Anomaly spoke with their stolen voice. "If you were… to look up, you'd see the moon is… red. If you want to survive, you will need… to create weapons and shelter?" Quentin replied. "Yes, Anomaly, we will have other allies, and time to prepare. But we need the assistance of the Other Powers to even stand a chance." Anomaly didn't respond, but stepped forward to stand beside the Keeper. Aberrant stood, trying to think. He didn't know who these people were. He didn't know why he had been chosen for this. What chance did he stand against the Moon Lord, the monster of so many myths? This mission would likely end with his death. Perhaps the Abomination had the right idea. He could run, hide, survive. Leave the heroics to more powerful, more selfless people. But then he imagined the Moon Lord tearing apart the village that had -- reluctantly -- welcomed him in. People would die if he didn't help. Faces flashed before his eyes: the old man who knitted his scarves, the girl who invited everyone -- even him -- to her parties, the boy who loved to fish. Aberrant wrote on his board [I will go], and stepped forward. Quentin spoke casually. "You know, if the Moon Lord destroys the five worlds, you won't be able to plunge them into eternal darkness. Ever. And don't think you'll escape death. If the Moon Lord doesn't kill you…" He hefted his hammer. "I won't hesitate to hunt you down like the worm you are." The Keeper clapped their hands. "Excellent. Now, you must depart at once. There is no time to waste. Please follow me, I have a mirror ready for you." Aberrant followed a bit behind the others. The walls of the fog-shrouded corridor were lined with mirrors in every shape and size imaginable. He didn't like this place. Nothing felt solid. It was a corridor of alien dreams, sterile and reflective. Quentin slowed down to walk beside Aberrant. "So, Anomaly serves to prove the Hallow worthy. Abomination is in it for power, and out of fear. You have no love for the Corpse, and no lust for power. Why are you doing this?" "An altruist Face Monster, never thought I'd--" Aberrant growled. "Right, sorry. For what it's worth, I hope you don't die. The Abomination and the Anomaly, the world could do without. You… you seem like a good person. " The Keeper stopped in a circular chamber, where a huge mirror stood upright, framed with gold scrollwork. "This will take you to the Third Moon, where the three Other Powers reside. Convince them to join our efforts and give them these." The Keeper handed Anomaly three cloth-wrapped packages. "When the Conjunction is about to begin I will summon you to the Fourth Moon to prepare. That is where the Moon Lord is sealed, and where it will rise. You have two weeks." Anomaly was first to go, passing through the mirror as though it were quicksilver. Abomination followed with a final irritated hiss. As Aberrant was about to step through, Quentin laid a hand on his shoulder. "Good luck out there." Aberrant wrote out [Thank you], and took one last step forward into the mirror. Th3KrustOfSk3l3tron, Plasmatiel, Tyrax Lightning and 27 others like this. I plan to use CC to improve my building skills. I might not enter every month though. To everyone else who entered, good work! Super fun entries this month. And all of the logos look great, so much creativity from everyone. Thanks to darthmorf and Quackers for compiling everything each month. Almighty bobbit worm and darthmorf like this. Strangely, when you say everyone, I feel like that skips over me. For no reason whatsoever. It's not you, it's me. Strangely. You gotta believe in yourself Lime. Yaaaaayyyy! There’s my piece of amature balloon art! Time to get crackin’ in the next project! Great work everyone! 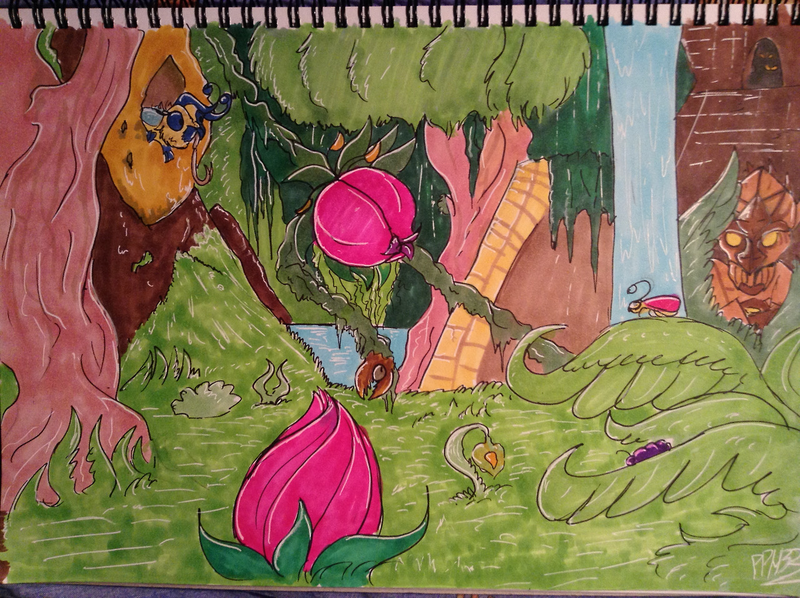 So many amazing entries for this month's CC, This is why I love the Terraria community.